Are mortgage brokers the weakest link? Have we finally found the Achilles heel in Australian property? For years know I’ve watched people try to find the Achilles heel in the Australian property market. And for years, while house prices have remained high (= higher than people would like), there’s be no obvious trigger for collapse. And without a trigger for collapse, house prices didn’t, funnily enough, collapse. Typically, house price falls are driven by two things. Either you need a big economic shock or recession that hits peoples incomes and forces a flood of homes on to the market. Or, you need some ‘black ops’ activities going on in the market that escalate the risks without anyone knowing what’s going on. The most recent crash in the US was one of these black ops scenarios. (Though when I say crash, most states have totally recovered their price falls by now). In the US you had the infamous NINJA loans – loans that were issued to people with No Income, No Job and No Assets. These high-risk loans were then packaged up in fancy financial instruments and sold to the rest of the financial sector, spreading and amplifying the risks all over the place. And this is what gave us the GFC. NINJA loans were the Achilles heel that took down some of America’s biggest banks. But until now, none of the doomsday guys could tell us what the Achilles heel of the Australian property market was. But now some people think they’ve found it. 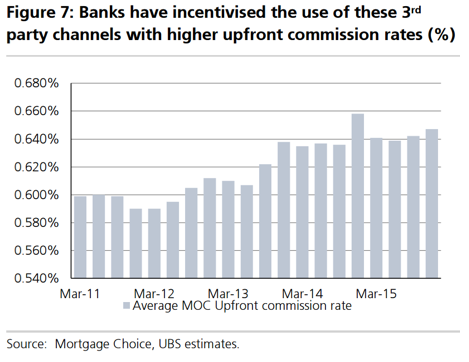 More and more you’re hearing people say that Australia’s mortgage broker channel is the weak point in the system – the weakest link. The idea is that the banks have outsourced a large chunk of their underwriting processes to a third party – the mortgage brokers. 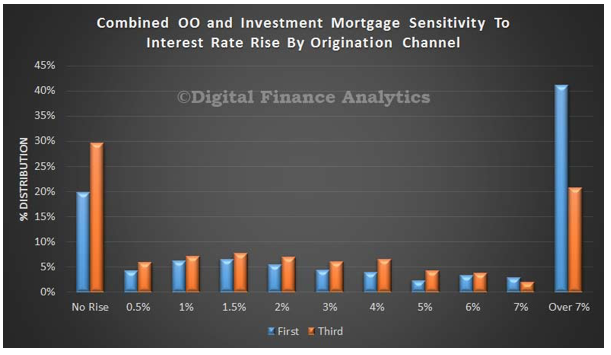 These brokers are incentivised by quantity (commissions based on loan amounts) rather than quality, and so there’s an incentive for them to ‘fudge’ the numbers a little. If enough brokers are fudging enough numbers, then the system is much more fragile than we think. It would mean that there is a large share of the market is already stretched to the limit, and any hit to jobs or incomes would wipe them out. If there is a large number of people in this situation, and they all try to off-load properties at the same time, then a rush of properties onto the market starts to push prices down. Falling prices pull more people underwater, forcing more sales, and pushing prices down even further. This is exactly the dynamic we saw in the US. So is this the fate that’s waiting for Australia? Have we finally found the weakest link? It’s hard to get a good read on this. ABS Survey 274B, which asked mortgage brokers “Are you dodgy, or do you plan on being dodgy sometime in the coming 12 months, Yes/No?” has been discontinued. 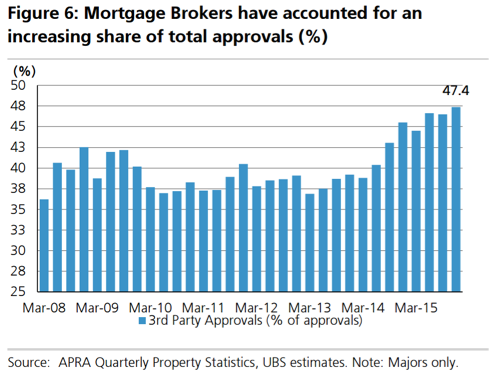 Well, we do know that mortgage brokers have accounted for an increasing share of loan approvals, up from around 35% of loans at the Big 4 in 2008, to around 47% now. Broker loans have similar LVRs to bank-direct loans, though there is a bit more action north of 90%. 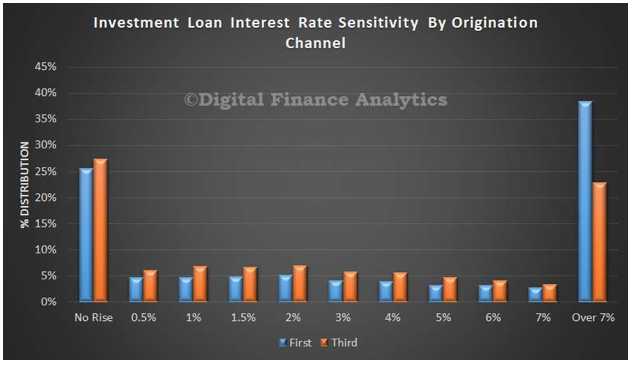 They also show that people with broker loans are a bit more sensitive to the prospect of rate increases. As this chart shows, almost a third are stretched already, and would struggle to accommodate any rate increase. However, when you break it down, this is mostly because owner-occupiers have stretched themselves. There’s little difference when you look just at the investor loan book. So is this the smoking gun we’ve been looking for? It is true that the mortgage market has structurally changed over the past few years. But in the information age, in the era of flightcentre.com.au, people don’t expect to have to do all the leg work themselves. Mortgage Brokers are an obvious solution. 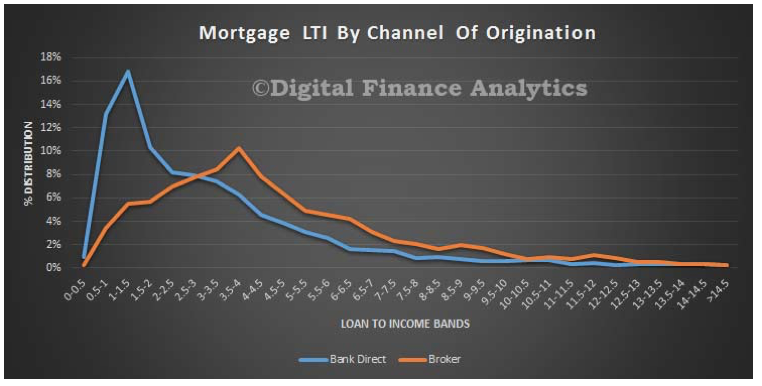 Looking at the types of loans coming out of the broker channel, they do appear to be helping people get bigger loans relative to their income and to the value of the property. But this is kind of the point. I think about my portfolio strategically, and I’m looking to optimise leverage and available equity. I sit down with my mortgage broker, figure out what I need, and he finds me the right loan for my strategy. That’s what he’s there to do. So you would expect these two metrics to be higher. And if you looked at how stretched people are with their loans, there’s some evidence that mortgage brokers are helping owner-occupiers stretch further than the banks might allow them to. However, there’s no evidence that investors are getting an easier run through the mortgage brokers. This is kinda important when thinking about systemic risk. Owner-occupiers tend to stay put when things get tough. It’s investors that might look to liquidate a property or two when push comes to shove. But if mortgage brokers aren’t helping investors stretch a bit further, we’re not creating the prospect of a flood of properties coming on to the market the next time the economy hits a soft patch. I’m working with limited data here, but I’m not seeing a smoking gun. I’m seeing an industry in transition, and I’m seeing mortgage brokers doing what they’re supposed to do. That’s not to say there are not dodgy apples in the barrel. There could be. But if we’re looking for something big enough to take down the entire property market, I’m not seeing it. What do you think? Are mortgage brokers the weakest link?